Rajasthan worldwide is famous for its forts, palaces, desert landscape and camel safaris. Known as land of kings, Rajasthan does rightly possess a plethora of monuments in the form of forts, palaces, ancient mansions, temples etc. But, the cultural heritage, lifestyle of rural populace, ancient water conservation system, colourful buzzing bazaars, craftsmanship, wide range of handicraft items, glorious history of valour, religious practices, festivals etc make Rajasthan a perfect tourist destination. 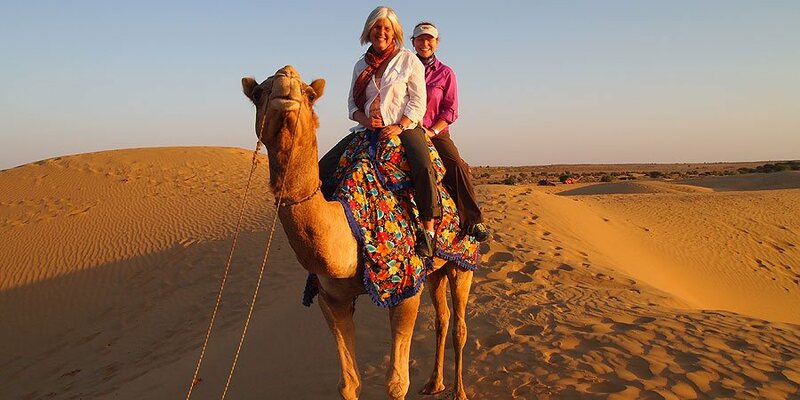 Real Rajasthan tour is designed to show the guest all of these aspects, reality. On arrival at New Delhi airport, you will be welcomed by our representative and taken to the hotel. He will assist you in ensuring smooth check in. Have sound sleep to be refreshed and relaxed to begin sightseeing tour of India. Having taken breakfast in the hotel, the sightseeing of Delhi will commence along with the guide. It starts with a dive in the heart of the Indian capital, visiting Old Delhi. Visit the largest mosque in India, Jama Masjid , opposite the Red Fort in the heart of the popular neighborhood of Chandni Chowk. One may have possibility to climb to the top of the minaret by a steep and dark stairs (better not be claustrophobic! ), but the view from the top is spectacular. Then join on foot or on a manually pulled rickshaw to explore the oldest and most famous market of Delhi, located in the famous street Chawari Bazaar and known for lively thoroughfare, crowded with workers carrying loads on their backs, cars, scooters and battling pedestrians to break through during the hours when the market is in full swing. After visiting Old Delhi, proceed to New Delhi to see the colonial buildings, the India gate (India gate) and Rajghat, so named in memory of Gandhi. After lunch, move to South Delhi to visit the tomb of Humayun , the first example of the monumental scale that characterizes the imperial Mughal architecture. Conceived and built, it is believed, by Humayun's widow Hamida Banu Begum. The tomb is the first to bear the imprint of a Mughal emperor. Humayun's Tomb is one of the best preserved Mughal monuments in Delhi. Hereinafter, visit Qutub Minar. Return to the hotel late in the evening to spend evening in leisure and have overnight stay. After breakfast, depart by road to Agra. It takes about four hours to arrive at Agra. On arrival, you shall directly be transferred to Agra hotel. Having relaxed a bit, the exploration of Agra will commence. Agra tour guide will be introduced with you in the hotel’s lobby. Located on the banks of the Yamuna River, north of the state of Uttar Pradesh, Agra is home to the most famous monument of the India: the majestic Taj Mahal. Agra reached its peak as the capital of the Mughal emperors from 1526 to 1658 and remains a major tourist destination because of its beautiful buildings of the Mughal era, listed as UNESCO World Heritage Site.The best time to visit the Taj Mahal is in the morning, at sunrise, before the arrival of cars of Indian tourists. Your sightseeing will start by visiting the imposing Red Fort, second largest monument of Agra. Built by Akbar, third Mughal Emperor, its sandstone walls surround the beautiful Moti Masjid, Pearl Mosque, all white marble, but also palaces, courtyards and fountains built under his son and successor, Jahangir and Shah Jahan . The latter spent the end of his life imprisoned by his own son Aurangzeb in the Agra Fort. In the evening, you will watch the sunset over the Taj Mahal from Mehtab Bagh (Moonlight Garden): you cross the Yamuna River, which flows behind the Taj Mahal and take a short but pleasant walk towards Mehtab Bagh. From there, you can admire the Taj Mahal in all its glory, during sunset. Return to the hotel late in the evening to spend evening in leisure and have overnight stay. Visit the Taj Mahal, whose sublime mausoleum of white marble changes color depending on the sunlight. 300 years have elapsed since its construction but weather could not alter its beauty and symmetry. Built by Shah Jahan in honor of his beloved wife, Mumtaz Mahal (who had already given him fourteen children before dying during childbirth! ), and built in twenty-two years (1630-1652) by 20,000 workers, masons and jewelers, it raises its domes in perfect symmetry in landscaped gardens. Having seen Taj Mahal, return to hotel to refresh and enjoy breakfast. Thereafter, in the afternoon, short transfer to visit Fatehpur Sikri, the deserted city of Emperor Akbar. This impressive citadel, well preserved, was the capital of the Mughal Empire in 1571. Its red sandstone mosque could accommodate 10,000 worshipers. But this magnificence lasted only fourteen years since the city was abandoned in 1584 due to lack of water. Now proceed for Jaipur. Jaipur, the pink city, capital of Rajasthan, built in the eighteenth century, is known for its pink sandstone palace and wide avenues. You shall directly be transferred to Jaipur hotel to spend evening in leisure and have overnight stay. The day is dedicated to the visit of Jaipur, one of the most attractive cities in India and the most colorful. The sightseeing will commence with visiting Amber Fort, erstwhile fortified capital located 13 kms from Jaipur city centre. Located on a hill, this magnificent fortification houses beautiful and large palaces & courtyards. The buildings inside have rich and fine decorations, inlaid panels of alabaster and bedroom ice. The main gate of Amber Fort can be approached either on foot or by car or elephant ride. Elephant ride from foothill to hilltop is a pleasant and exotic experience, not to be missed. Having explored Amber Fort, return to the heart of Jaipur city. In the center of the city, the City Palace, residence of the Maharaja, is now converted into museum with rare manuscripts, paintings, royal ornaments and weapons. Not far from the palace is one of the most fascinating sites of India, Yantra Mandir, also called Jantar Mantar. Observatory built by order and under supervision of King Jai Singh II, it presents a set of astronomical instruments of marble and copper arranged in a pleasant garden. Thereafter, stop in front of the historic Hawa Mahal, the Palace of Winds, whose facade is famous worldwide. Now, you have ample time to explore colourful buzzing market of Jaipur. Late afternoon, you shall be taken to Birla Temple where you shall attend evening aarti- the deity worship ceremony. After fulfilling experience of Jaipur, you shall be transferred to Jaipur hotel to spend evening in leisure and have overnight stay. After visiting Chittaurgarh, proceed for Udaipur which is almost 100 kms away from here. You will be received by our representative on arrival at Udaipur and ensured smooth check in at the pre-booked hotel. Spend rest of the day at leisure or relax. Return to Udaipur hotel for overnight stay. After visiting Ranakpur temple, proceed for Jodhpur which is almost 190 kms away from here. Our representative will receive you on arrival at Jodhpur and ensure your fuss-free check in at pre-booked Jodhpur hotel for overnight stay. On 10th day of Real Rajasthan Tour, you will be taken to craftsmen villages of Bishnoi tribe. Having enjoyed delicious breakfast in Jodhpur hotel, move on an excursion to Bishnoi village to have a look of real rural life in a Rajasthani village and villagers’ skill sets and value systems. Enjoy mingling with rural folks, participate in religious rituals & experience real Rajasthan. The Bishnois, a non-violent and nature loving sect of Hindu religion, are known for their harmonious co-existence with the nature and the animals. The Bishnoi community is known for its craftsmanship. The next stoppage on your Real Rajasthan Tour is Jaisalmer. Having taken succulent breakfast in Jodhpur hotel, depart for Jaisalmer, the ‘Golden City of Rajasthan’. Our representative will receive you on arrival at Jodhpur and ensure your smooth check in at pre-booked Jodhpur hotel. Relax a bit and have lunch in Jaisalmer restaurant. Hereinafter, move on a half day leisurely sightseeing tour of havelis of Jaisalmer. The half-day sightseeing tour of Jaisalmer will include prominent havelis like Nathmalji-ki-Haveli & Patwon -ki-Haveli along with Manak Chowk. Manak Chowk is the main marketplace outside the fort leads to the narrow lanes dotted with famous havelis. After enjoying relaxed but vivid sightseeing of Jaisalmer, return to Jaisalmer hotel for overnight stay. Accommodation in the hotel on double occupancy basis at all places. Daily breakfast basis at all places. one night stay in a Swiss tent in the desert area in Jaisalmer on breakfast & dinner basis. Manual rickshaw ride in Chandni Chowk market of New Delhi. Tonga (horse carriage) ride in Agra. Boat ride inn Lake Pichola in Udaipur. Bishnoi village safari in Jodhpur. Camel ride in Jaisalmer desert. Morning boat ride along the ghats in the Ganga in Varanasi. Train tickets from Agra to Jhansi in air-conditioned chair car. English speaking and destination specific guide for all sightseeing tours. Air-conditioned car for the whole tour. English speaking driver for the full tour. All prevailing taxes like luxury tax, service tax, interstate road tax, toll tax, parking etc. Fuel charges, driver’s daily allowances, driver’s meals and stay. Above rates are based on current exchange rate, fuel price, entrance fee, hotel rates and tax structure as applicable on the date of mailing the package proposal, however any change in these components beyond our control shall affect the cost accordingly. Our Above all cost is based on good combination of Heritage & star hotels. All the hotels are neat and clean, tastefully decorated air-conditioned rooms and of international standards with all modern facilities. We have been using these hotels regularly for our various overseas clients with excellent report in respective categories. In case you are particular to stay with any preferred hotels, please do let us know and we will revise our cost accordingly. If a particular hotel is stated in this travel proposal is not available, we will book you at an alternative hotel in the same category as the one stated with your consent and agreement. We do not have any insurance policy covering the expenses for accident, sickness, loss due to theft, or any other reasons. Visitors are advised to seek such insurance arrangements in their home country. Please contact your health department or the nearest Indian consulate for more information on recommended vaccinations and medical precautions. You will need a tourist visa to visit India . Please contact the nearest Indian consulate in your country of residence for more information. In India, hotel check in time is 14:00 hrs & hotel check out time is 10:00 hrs, until specified otherwise. Our cost doesn’t have any hidden taxes/charges. We would require 50% advance payment to secure your bookings and process the file. We accept bank transfers and payment by credit cards through PAYPAL international payment gateway only. Balance amount needs to be paid on arrival in India by cash, Traveller’s Cheques or credit cards. All credit card payments are subject to 4.88% bank fees. 50% cancellation if cancelled within 45 days. 75% cancellation if cancelled within 30 days. 100% cancellation if cancelled 15 day or less.